IQ actuators on Tupras Izmit Refinery. A major petrochemical modernisation programme in Turkey includes a retrofit project that will deliver automated actuation and control for over 900 valves at a refinery’s tank farms. Tupras is Turkey’s largest industrial company and leading refiner, operating four refineries of which the Izmit Refinery, in Kocael Province by the Sea of Marmara, is the largest. First opened in 1961, production at Izmit of commodities including LPG, naphtha, petrol, jet fuel, kerosene and diesel is now running at over 11 million tons a year. The retrofit project, involving the installation of Rotork intelligent valve actuation and two-wire digital control technologies, is part of a massive expansion programme which also includes the construction of new refinery facilities on an adjacent site by the Spanish company Técnicas Reunidas, for which more than 400 IQ electric actuators are being supplied through Rotork’s Spanish subsidiary company. Retrofit work in progress. 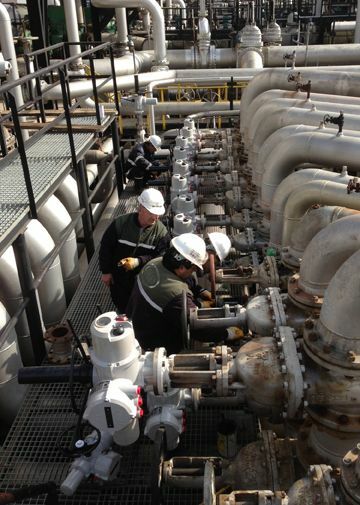 Engineers from Omas work on one of the tank farm manifolds at the Tupras Izmit refinery. 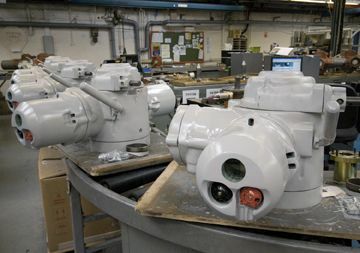 More than 900 ATEX Certified explosionproof Rotork IQ intelligent electric valve actuators are being installed in a four stage project to motorise manually operated valves on the refinery’s tank farms. Nearly 800 of the actuators will be retrofitted on existing valves whilst the balance will consist of new actuated valve packages. Many of the actuators will be factory fitted with intumescent fireproof coatings and all will be monitored and controlled on Pakscan two-wire digital networks. Rotork’s experience of retrofitting actuators on existing valve installations began in the early years of the company’s history and since the 1960s there has been an area of the business entirely dedicated to retrofit activity. Decades of experience has encompassed projects of all sizes and descriptions. In virtually every case, one of the most important considerations is the successful integration of retrofitted equipment with minimum disruption to normal plant operations. Working from basic valve data collected from site a full sizing service enables the actuator models to be matched to the valve requirements. 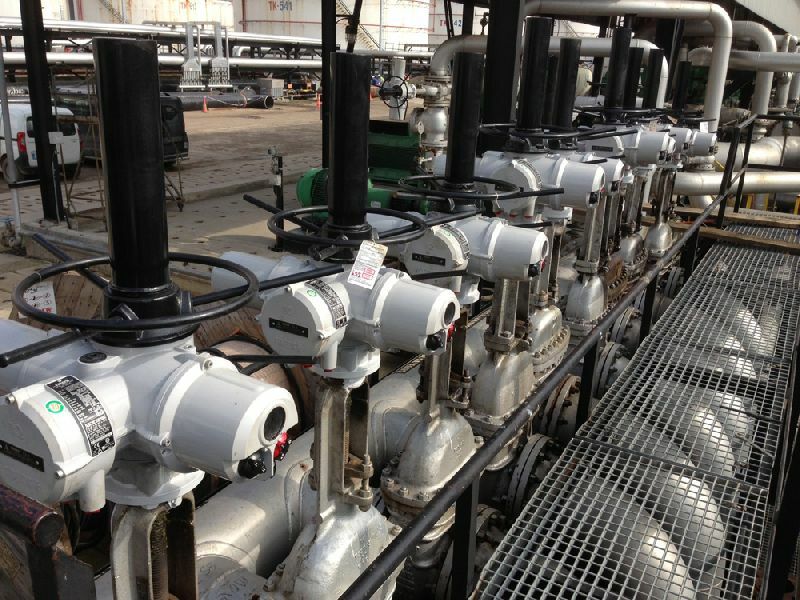 This preliminary activity is followed by a detailed site survey to collect all the dimensions required to design the mechanical components required for mounting the actuators on the valves, together with associated cable runs and ancillaries. The compact dimensions of the IQ actuator facilitate installation in limited spaces often encountered with crowded groups of valves as found, for example, on manifolds. Where access to a valve is severely restricted, safe remote-drive solutions are engineered, involving extension spindles, pedestals and adaptors, using well proven methodologies and sound design principles. With the addition of the Pakscan two-wire digital control system, Rotork is able to extend its retrofitting capabilities from the valve in the field into the control room with a continuous chain of robust, proprietary actuation and control equipment. Designed specifically for the valve actuation environment, Pakscan provides a direct interface with host control and SCADA systems whilst simplifying the overall control network, optimising actuator functionality and increasing reliability. The retrofit activity at Izmit is being performed by Rotork’s well established agent in Turkey, Omas Teknik Pazarlama Temsilcilik. Omas’s responsibilities include the design and fabrication of valve adaptation, installing the new actuators, commissioning and on-site support. The new actuated valve packages are being assembled and tested in the Omas workshops prior to delivery to site. The expertise, experience and comprehensive facilities available from Omas at a local level are key components in the success of this major retrofit project. The risk of fire can be a serious cause of concern in a refinery which can be minimised by the efficient and effective protection of vital systems such as actuators on critical isolation valves. For this reason Rotork can provide a range of fire-proofing options, allowing actuators to continue operating for significant periods of time in fire temperatures of over 1000ºC. The System-E intumescent coating system which has been adopted at Izmit has been specially developed and tested for use with IQ electric actuators. The factory-fitted coating is moulded to the actuator and in a fire will swell to between four and five times its original thickness to form a lava-like char which insulates the actuator and reflects heat back to the fire. After the initial formation of the char, the coating remains passive until heat penetration through the char reaches a temperature at which the passive material is again activated. This process is repeated until the passive material is depleted or the fire is extinguished. This very effective thermal barrier is proven to repel 80-90% of the heat of a fire, providing protection for the actuator for more than 30 minutes at 1093ºC. The weatherproof coating adds only minimal dimensions to the actuator, which retains all its design features and non-intrusive functionality. Rotork IQ actuators with System-E intumescent fireproof coatings, en-route to the Tupras Izmit Refinery. The non-intrusive, explosionproof and permanently watertight design of the Rotork IQ has a proven record of long term reliability and low cost of ownership in the petrochemical industry. The use of solid-state electronics as an alternative to switch mechanisms and counter limiting devices, combined with programmable micro-processor based control and instrumentation functionality, offers many proven benefits. Secure non-intrusive technology by means of a hand held instrument and a secure, bi-directional link is utilised for setting control parameters, commissioning and downloading integral data loggers. This system is used to perform all the switch setting and commissioning functions that were traditionally only achieved by removing electrical covers. Using the multi-lingual menu on the actuator display screen, it is quick and easy to commission the valve, with or without mains power connected. The same instrument can be used to download this data and upload it to other IQ actuators with similar commissioning parameters, simplifying and speeding up the operation, or to download actuator operating information from the actuator’s data logger to provide vital diagnostic information for asset management programmes. The inclusion of a data logger enables an event-by-event history of valve activity to be generated, including the torque profiles produced during each opening and closing. Log data is time and date stamped and can be viewed on an event-by-event basis. Using Rotork’s IQ-Insight software on a PC, this data can be compared with the valve torque signature profile logged during the commissioning process to identify the trend of valve operating wear or isolate tight spots and other problems. Analysis of this data improves asset management through fault diagnostics and preventative maintenance. IQ-Insight software also enables the operator to pre-configure or update actuator settings on a PC, transfer them to the setting tool and transmit them out in the field to the actuator. Digital two-wire control at Izmit is provided by Rotork’s proprietary Pakscan P3 system, the third generation of a market-leading product, capable of monitoring and controlling up to 240 field units without repeaters on a single highway with a length of up to 20 kilometres. Designed specifically for the spacious environments associated with tank farms and similar flow control plants, Pakscan combines high reliability and efficiency with low maintenance costs. In providing the vital link between the actuators in the field and the centralised supervisory control room, Pakscan incorporates secure field communications with inbuilt network redundancy to maintain control even in the event of equipment or cable failure. Rotork Pakscan has been widely adopted in many worldwide industries, where the use of a fully redundant two-wire bus loop linking multiple numbers of actuators over long distances is recognised as delivering reliable monitoring and control with dramatically reduced installation and cabling costs in comparison with traditional hard wiring. Due to the size of the Izmit refinery site, groups of IQ actuators in different areas will be monitored and controlled by a total of twenty Rotork Pakscan P3 digital bus networks. Each network is controlled by a Pakscan P3 master station which provides a local centre for monitoring and control and links the network to the site’s SCADA system. Pakscan networks use a unique proprietary protocol that achieves very fast update times whilst using relatively low date transmission rates. Compressing the data field to a minimum length allows more data to pass over the network in a given time at each data rate. The result is a system that can handle long transmission distances and a large number of actuators, without repeaters, whilst still maintaining swift, reliable and efficient communication. At the P3 master station, current status and alarm indication is updated when data has changed, providing real-time status indication of every actuator on the network. Information includes torque profiling to provide an accurate indication of valve performance. Re-programming of individual actuator parameters can be performed at the master station or remotely via the host serial or Ethernet link. An event logger captures and saves every major change in the status of the actuators as well as recording all digital and analogue commands. Logged data is viewable at the master station or on web pages, where the data can also be stored for future asset management reference. The inclusion of a long-term data logger (LTD) with removable memory card in the P3 master station further extends data logging and diagnostic capabilities. Data stored in the removable LTD card is logged on a day-by-day basis and independently captures all Modbus command messages and changes to actuator status and alarms, with the capacity to store multiple years worth of information, which can be viewed on a PC running Rotork LTD software. Connection to the host system is by Local Area Network and Ethernet communication with a built-in secure web server using web pages to enable easy extraction of files. The protocol used for data exchange and control is the widely recognised Modbus TCP. Each Pakscan P3 master station provides a local centre for monitoring and control and links the actuator network to the host controller.